Visit Plymouth: National Express is stepping up its services to the South West in a bid to help stranded rail passengers. In light of the damage to rail lines in the South West caused by the recent storms, the UK's largest coach operator has today (Friday, 7 February) added five new express services to cope with extra demand already seen from the region. Starting from Monday (10 February), the new express services will run directly between Plymouth, Heathrow and London, maintaining a transport link for passengers who normally rely on the train. The fastest services will reach London in four hours - quicker than the rail replacement alternatives. With the disruption to the railway from Cornwall and parts of Devon likely to continue for many weeks, National Express has also committed to add as many coach seats to its existing services as are needed to meet demand, and keep its prices fixed at standard rates. Plymouth City Council: Immediate and substantial action from the Government is needed on the South West rail line in the wake of the collapse of the sea wall at Dawlish, says the Council leader Tudor Evans. Councillor Evans said: "Our economy cannot be allowed to hang by the thread that is our precarious rail network, which is once again under water today. Promises made about rail resilience funding are as empty as the void that is now where the Dawlish wall used to be." Plymouth City Council Leader Tudor Evans: "This is beyond critical. Plymouth is the 15th largest city in the country and we have one single rail line. And that line is now dangling over the sea. Last year's prolonged flooding episode on the network cost the region's businesses £130 million over just two weeks. I fear that the level of disruption we are facing now could have a catastrophic effect. "Here we are 12 months on from the last time the peninsula's transport network came to a grinding halt and what has happened? Nothing. How many letters do we have to send? How many delegations do we have to organise to make the government listen?" Pictures of the week: LT150 - LTZ1150 seen in the Aldwych on its third day of operation. Cetral Station: Roadworks near Central Station mean diversions to buses heading out of town. Buses heading eastbound into the city centre are unaffected. There is a error in that report about the re routing probably two! One: The Dawlish line will open in mid March not mid April. The Network Rail says it hasn't planned to do the Okehampton - Tavistock diversion route! I think the BBC has an agenda to remove the Sea wall line! Surely it would be better to look at the route via Okehampton and Tavistock as an alternative and not a replacement line. I have seen a suggestion on the Great Western Coffee Shop discussion group, which I thought is a good one. That is to incorporate the Okehampton and Tavistock route into the South West Trains franchise, extending it from Exeter to Plymouth. This would provide competition as far as Plymouth with the Great Western, as well as providing an alternative route? The Okehampton line would make a useful divarsionary route for trains going to Plymouth and Cornwall, but not for those going to Torquay and Paignton - which, presumably, would still have to use bus replacement. The track-bed of the line between Okehampton and Bere Alston is still in place and could, presumably, be compulsorily purchased from its current owners. To me, the only obvious difficulty would be getting through Tavistock - assuming the viaduct there is still sound, it would need a new bridge over the Callington road, demolition of a couple of houses and possibly an adjustment to the size of the Council offices. There is space for sections of this line to be double track. 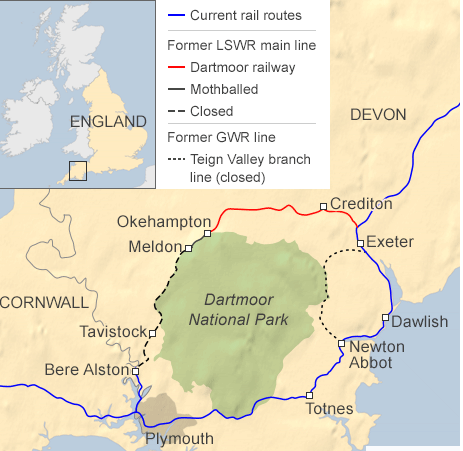 I am sure (yesterday on BBC Spotlight I Think) the engineer in charge of repairing the railway line breach at Dawlish said that the route via Okehampton and Tavistock was Network Rail's preferred option for an alternative route? Apologies it was not the engineer in charge, but the Network Rail Regional Manager whom I thought said that the route via Okehampton and Tavistock was their preferred option. I think that would be a good idea for SWT to use the Okehampton to Plymouth Line BUT I hope it wouldn't affect the current service, I mean they could take the 158's off the Lymington branch and other services they are used for!